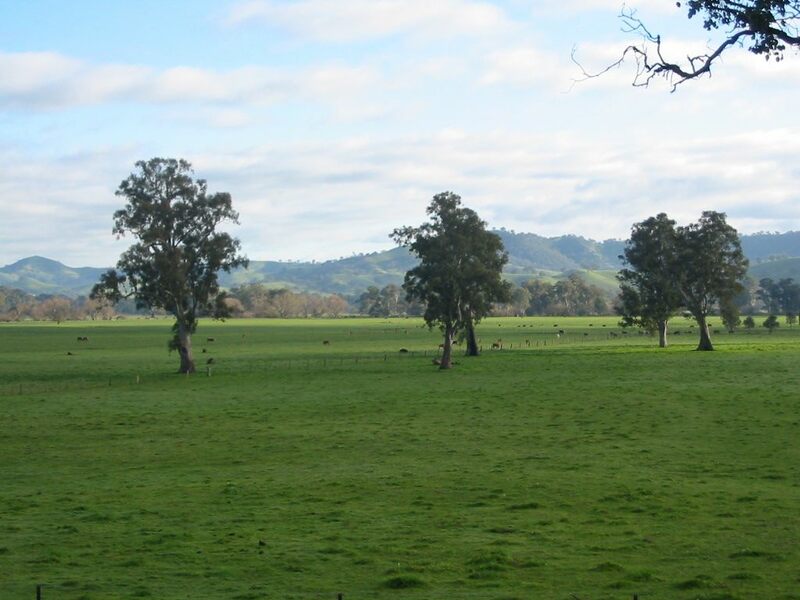 The Ranges are separated from the main Great Dividing Range by the valleys and floodplains created by the Goulburn and Broken Rivers. Being separate from nearby areas of similar elevation and high rainfall has resulted in some interesting and unique biogeographic and ecological patterns. This is my layperson’s summary of lots of technical detail – I can’t guarantee that its without error, but if you can help, I’d be happy to improve it. 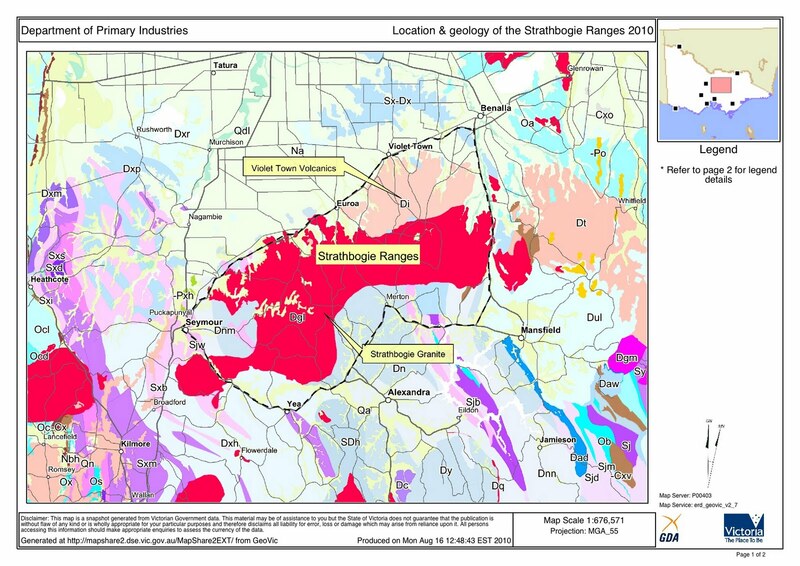 The geological map at right shows the Strathbogie Granite and the Violet Town Volcanics which together make up the Strathbogie Ranges. The Violet Town Volcanics is an area where magma of similar origin to the Strathbogie Granite erupted at the surface and formed a cauldron volcano. These volcanic rocks, though similar in composition to the granite, are called rhyodacite. About 425 million years ago (when the land was largely barren and fish were the highest form of animal life), Australia was connected to Antarctica and both were still part of Gondwana, the “Great South Land”; most of the planet’s continents were located near the South Pole. At this time, most of what was to become Victoria, and much of eastern Australia, were under water – in fact under the ocean. These oceans were adjacent to the then coastline of Gondwana and received huge amounts of the weathered sediments washed and blown from that barren, rocky continent. Over tens-of-millions of years these sediments were compressed to form sedimentary rocks many kilometers thick that now comprise the basement rocks underlying much of Victoria. A modern-day equivalent is perhaps the deposition of massive amounts of sediment derived from the Himalaya and deposited on the ocean floor of the Bay of Bengal. 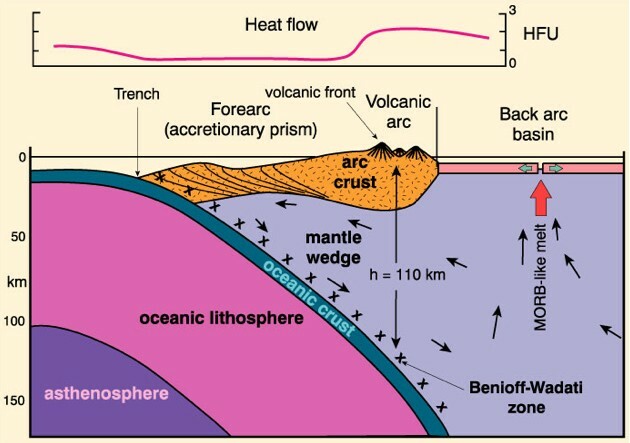 As the Australian Plate collided with the Pacific Plate, the sea bed (earth’s crust) between them was compressed, folded and fractured, and developed into a volcanic island arc, forming new land and a variety of new ocean basins. This region was the beginning of what was to become eastern Victoria. An island arc forming as the Australian and Indian Ocean plates collide with Asia. Island arcs are areas of volcanic mountain building: as one plate (oceanic) slides under the other (continental), the rocks at depth melt, become buoyant and head back to the surface where they often form volcanoes. This is what’s happening in the Indonesian and Philippine archipelagos and its how eastern Victoria was initially formed. Of course its a very slow process and no sooner is new land created (relatively speaking), than it weathers, erodes and is transported into the adjacent seas. So, for many millions of years this mountain-building and erosion cycle operated, slowly filling up the surrounding oceans with these eroded sediments. 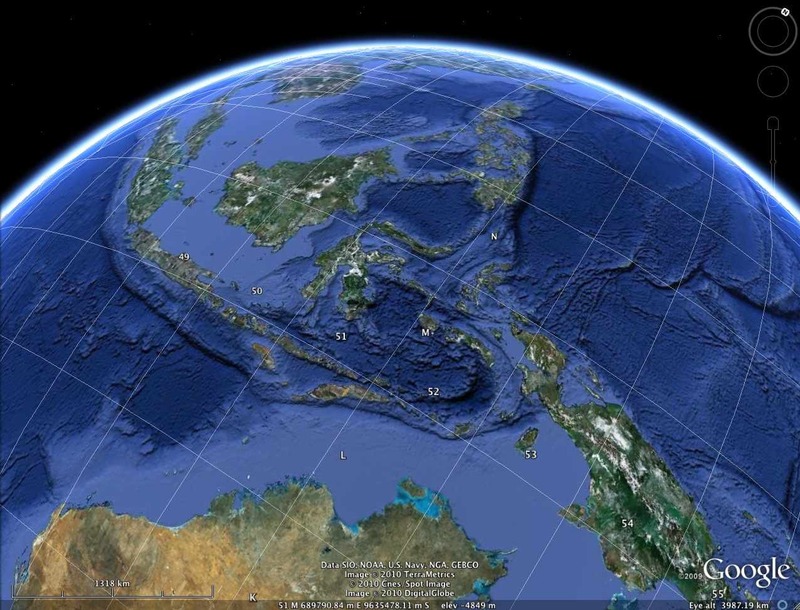 An island arc has formed (New Guinea, Indonesia, Malaysia) where the Australian and Indian Ocean plates collide with Asia. A similar process created much of SE Australia 360+ mya (Google Earth image). 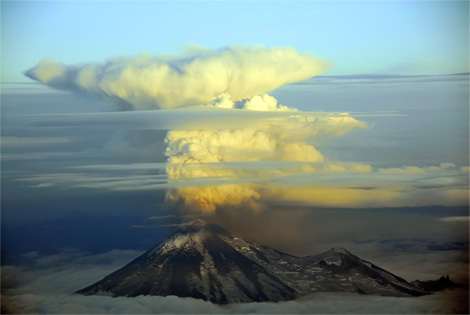 Occasionally, the boiling magma broke through the crust to form explosive volcanoes. The northern one-quarter of the Strathbogie Ranges was once a massive, 20-30 km wide, cauldron volcano that erupted at a time that geologists say was probably the most violent and volcanically active period in Victoria’s 600 million years of recorded geological history. A modern day equivalent (in type, but much smaller) might be the 1883 eruption of the island of Krakatoa, for example. These volcanics we’re erupted as pyroclastic flows- super-hot mixtures of rock fragments and gas erupting at high speed. It’s thought that these massive eruptions occurred not over millions or thousands of years, but perhaps in a period of weeks, months or years. Today, remains of volcanic rocks from such explosive eruptions are seen in the Marysville/Mt Torbreck, Tolmie, Violet Town and Delatite districts. 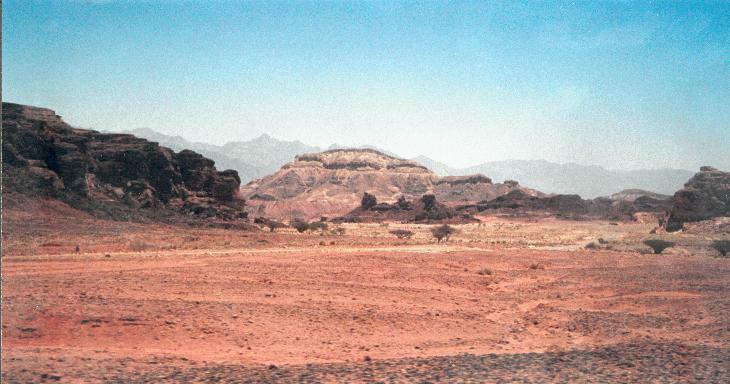 The remains of the Violet Town Volcanics of ~373 mya are so weathered, they blend in with the adjacent, but younger granitic rocks of the Stratbogie Ranges. Granitic pluton development, with sills and some volcanic activity. Around 370-360 mya (when primitive amphibians began to venture onto land), something different happened. More and more of that rising molten rock didn’t erupt as volcanoes, but became embedded, and slowly cooled, under the ever thickening and fractured sedimentary rock filling the shallowing seas and basins around the island arc. Such masses of accumulating, cooling magma often form discrete masses called plutons; an aggregate of plutons is called a batholith. One of these aggregations of rising magma became the Strathbogie Ranges batholith (which is made up of several smaller plutons, each with its own slightly different history). As more and more magma accumulated, the batholith slowly uplifted the overlying sediments, raising the whole area out of the sea and forming new land. This embedding of magma into the ‘country rock’ occurred very slowly, probably over thousands or hundreds of thousands of years and so, as the sea floor was uplifted and exposed to the air, it was also rapidly weathered and eroded. 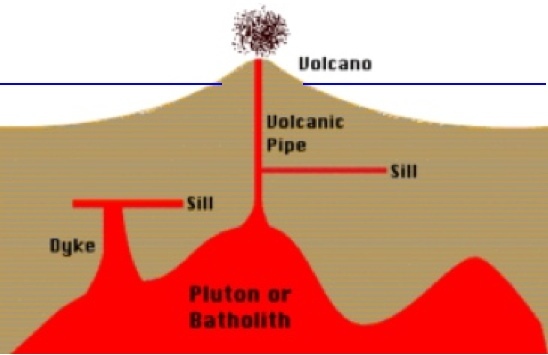 Eventually, the sediments overlying the granite were removed, leaving the granite exposed to the air (‘dry land’) and abutting the remnants of the cauldron volcano to the north. The volcanic rocks we see today are the base of the previously much higher stack of volcanics, that have since been weathered and eroded away. Though the cauldron volcano was once considerably higher than the granite outcrop, the intervening 360 my has seen both rock outcrops weathered to such a degree that there is no topographical distinction between the volcanic and granitic geology of the Ranges. Around the same time that the Strathbogie batholith was forming, the same was happening over large areas of northern and eastern Victoria. Other large intrusions of granite in northern Victoria occurred at Mt Disappointment Range, Black Range (Alexandra), Mt Buller, Mt Buffalo, Mt Samaria, Mt Pilot Range and Cobaw Range. Folded and twisted sediments from the time of Gondwana, when SE Australia was still under the ocean and not far from the common coastline of Australia and Antarctica. And all the while the eastern seaboard, including Tasmania, Victoria and NSW were undergoing slow E-W compression, which buckled and contorted the sedimentary rocks (see right). This buckling had the effect of heating and hardening the sedimentary rock, creating metamorphic rocks that are hardened and resistant to erosion. So sediments were being squeezed, buckled and hardened; granite batholiths were causing uplift (and also hardening the sedimentary rocks they came into contact with) and newly exposed land was subjected to ongoing erosion. By about 360-350 mya much of the oceanic island arc had been transformed into a terrestrial, mountainous landscape, ‘smeared’ onto the south-east margin of the Australian continent by the geological process called plate tectonics. The continents 255 mya (from PaleaMap Project). By about 250 mya marine conditions in SE Australia had completely given way to dry land and the next 100 my were times of erosion. Around this time, land plants were largely restricted to a narrow zone along the water’s edge, so the ‘softer’ sedimentary rocks that were uplifted had little protection from eroding wind and rain. The uplifted Strathbogie Ranges and other granite mountains were fairly quickly ‘de-roofed’ (overlying sediments removed), leaving the erosion resistant granite exposed. The sediment from the de-roofing helped to slowly fill the shallow basins of the rivers to the north, forming the plains of the Goulburn and Murray Rivers. Since that time these granite mountains have continued eroding, though at a slower rate. Interestingly, there are still a few places in the Strathbogies where some of those older, marine sedimentary rocks can still be found. Around 100 mya, when Australia was still firmly attached to Antarctica (though Gondwana was breaking up) and dinosaurs were nearing their peak, eastern Australia was subject to another bout of serious mountain building activity that gave rise to high mountains (much higher than today) along the south-east edge of the continent. When this mountain-building activity subsided, the high mountains again slowly eroded, leaving what we know today, in part, as the Great Dividing Range. In the time since their formation, the marine sedimentary rocks that comprise most of the upper catchments of the Goulburn and Broken Rivers have been buckled and twisted by volcanic and tectonic activity. 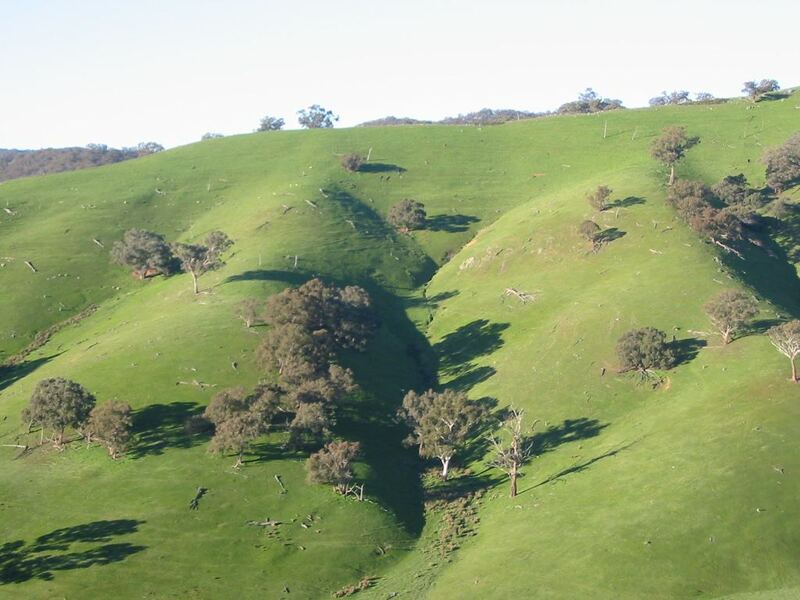 Rivers and streams have cut deeply into these deformed sediments, creating the characteristic dissected landscapes to the south and east of the Strathbogie Ranges. Throughout the area ridges and deep, straight valleys tend to follow the buckle- zones in those marine sediments, predominantly running north west-south east. These are the same sediments that once capped the Strathbogie granite to a depth of several kilometers. Since the granite has been exposed to the elements, even though it is a hard rock, it has also been slowly weathered, broken down. 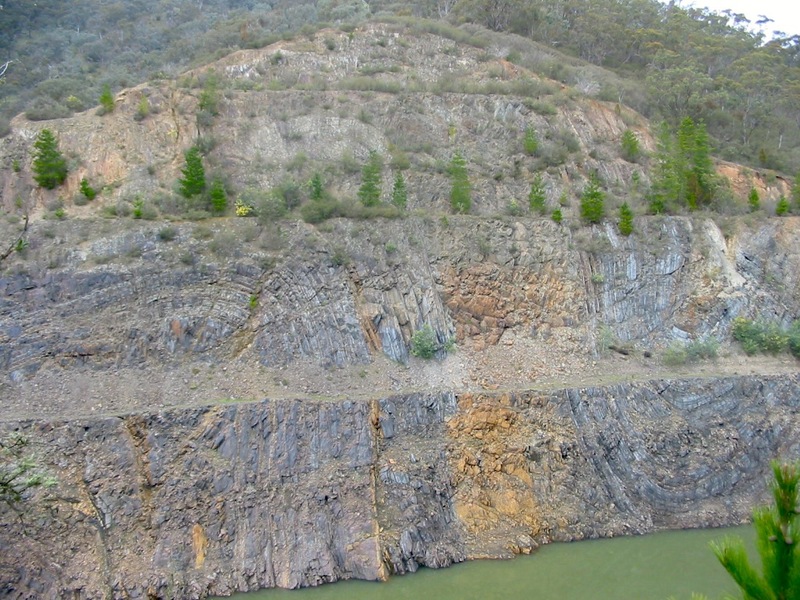 All the eroded material from the Strathbogie granite, the surrounding sedimentary hills and the higher Great Dividing Range has been washed down-slope and down-stream and has filled in the deep valleys and basins of the Upper Goulburn, the Murray Valley and the Victorian Riverina with sediment. The Goulburn River Floodplain – deep sediments eroded from the surrounding mountains now fill the valleys between mountain ranges.